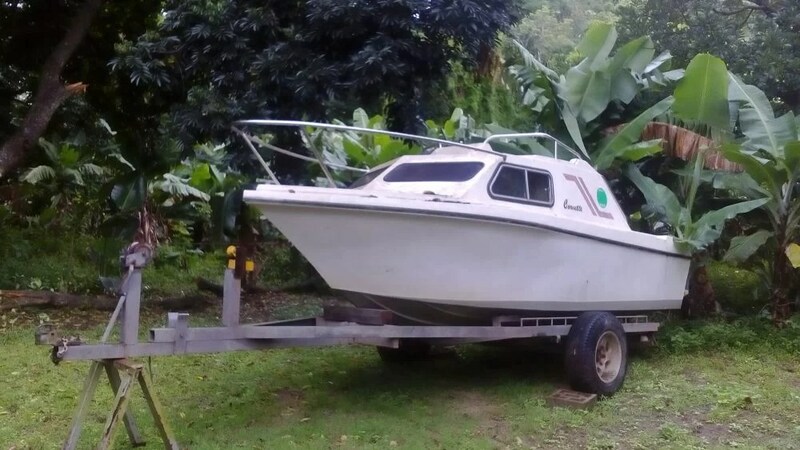 This is a really cool little boat. It even has a cabin - all night fishing is a go! The boat needs lots of work, we revamped the hull and cleaned it up when we bought it a while back, but that's as far as we got. It has a steering and cable too, but that's it, no motor. The real value in the deal comes from the kicka trailer. A solid well built and galvanised structure, with what looks like a FAD axle (not sure). AND. Proper mag wheels and good tyres. You could pack all your stuff in the cabin, and go anywhere with it. Like a little floating caravan!